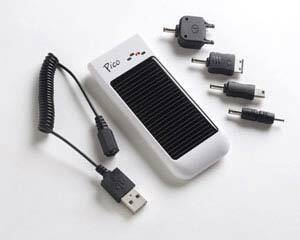 The PICO solar charger is an excellent entry level battery charger. Will charge most handheld electronic product with USB Charge cables. The latest edition to the freeloader range is the PICO, it is an entry level solar charger which is great for those who want an emergency charger. The PICO is also great as an affordable replacement if you want to leave your Freeloader or Freeloader Pro at home and just have a charger that you are not worried about leaving in a tent or in your pocket while at a festival or on an action holiday. Freeloader PICO is supplied with four connection tips, a master cable and a comprehensive user manual. PICO can also directly connect to any device supplied with a USB charge / sync cable, giving virtually unlimited connectivity. Also available Gel Cases for your PICO colour match to your mood and give the unit additional protection. Is the Freeloader PICO - Solar Charger compatible with the 3g iPhone? Your best bet at this price point is going to be the Rio. My colleague has your phone and has used it successfully with the Rio numerous times.